son for not settling him after apprenticeship. him after working for him for four years. "I started staying with my Oga in 2013.
promised to set me up after four years. be paying him N20,000 monthly. to pay me as agreed, but he refused. Rather, he sent me back to the village. him away," the suspect said. he was arrested on Apapa Road. again. I sent him my account number. police were on my trail," he added. 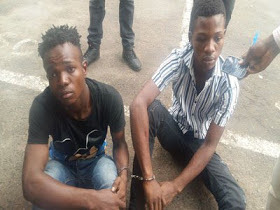 0 Response to "''I Kidnapped My Oga's Son Because He Refused To Settle Me"Suspect"